Christmas is slowly creeping towards us, silent like a ninja, but as noticeable as a reindeer on your roof if ever you were to see one! There are only a few short days left before the bells toll on Christmas Eve to summon upon us all that one day of the year we either dread, or look forward to; CHRISTMAS! Still, it's not here yet, so until then we can relax (or panic, depending on how you prepare for this money-grabbing day of the year) and listen to some peaceful music as we await for the day itself to come. 6 Days, then Christmas! What will Negicco send to me? I will openly admit that at first, I was not really into this song when I initially heard it when looking for Christmas songs to review this year or even when it was suggested to me on Twitter by a friend, and honestly even after it grew on me I wasn't really that sure that I would even consider writing about it, but actually, it seems to have grown on me since I first heard it. That said, I won't call it a 'favourite' song, but it has its charm. Hikari no Spur as a song is very calming and, of course, quite pretty. It has this soothing element to it that makes me think of a relaxed winter rather than a turbulent, hyperactive one that I typically experience every year in terms of both music and a general Christmas day, so it's a refreshing take on the songs I typically listen to. That said, it isn't a sad or serene song either, because it's quite expressive in vocals and rather up-beat in its nature, yet it's still somehow very gentle and soothing in sound. Really, it's very calming, but it doesn't have the same softness that Stay with me had - where P.IDL's winter song was a very soft calm, this one is an up-beat, friendly calm that feels homely and welcoming in a way. Then again, Negicco feel like a very friendly, homely group in general I think. In regards to the PV, I do think it's very pretty, however it makes me feel a little motion sick thanks to all of the shaking behind the camerawork. I like the idea of the entire video looking as if its a really sweet, home-made video that is more personal and less professional, however I can't get over how all of the shaking makes me feel. I suppose that's why I vetoed the idea of a PV review, because I couldn't really watch the video for too long. Still, it's a really well-made video and the girls look adorable in it. It feels friendly, it looks appealing (aside from the shaky camera) and it has a beautiful winter look to it and the feeling of friendship between the girls is wonderful. If you don't get motion sickness easily, then I do suggest watching the video for the full effect of the song and video together, because they are both great, and it's such a sweet pairing for an MV and song! Hikari no Spur, a friendly and warm winter song that keeps you calm during the season of hyperactivity and giving. What more could you ask for? I admit, I've not listened to this single a lot, however I was surprised by how pleasant I found the songs; Negicco have very soothing voices and compositions that suit them well, creating a nice atmosphere for each of their songs. Of all the songs on the track list however, I think that Koi no EXPRESS TRAIN is the most soothing, but also one of my least favourites. It's not that the song is horrible, because it isn't, but it just doesn't appeal to me as much as a song like 1000% no Kataomoi does. I suppose, for me, the instrumental is what does nothing for my taste buds; there is something in the background of the instrumental that sounds pretty off to me, however the rest of it is pretty good. It's a nice enough song, but in terms of what it does for me... well, it does nothing really. Koi no EXPRESS TRAIN is, for me, the possibly weak link of this entire soundtrack, but that doesn't make it bad; it's a nice little ditty, and I am pretty sure that there is someone out there who will appreciate it far more than me. I suppose for now, I just have to let it grow on me a bit. I put my hands in the air and say with the utmost honesty that this is, quite possibly, my favourite track on the entire single. I suppose it's that little 'oomph' in the beat that helps it somewhat, but I really do like the sound of 1000% no Kataomoi. It's a really fun song! It's not hyperactive, but it definitely has energy and that wonderful element of fun behind it, and it just sounds extremely appealing to me as a listener. I've listened to it only a few times, granted, but I already know that I actually do enjoy this song greatly; I don't mind that it's not a Christmas or winter jingle of any kind (that I know of, at least), but it's extremely enjoyable and easy to get into and, yes, I have been shimmying my shoulders along to the beat! It's catchy! I also love how the members of Negicco sound in the song, they really do fit this sound quite nicely. This song, of all the songs on this track list, is by far the most uplifting if you ask me. It has a great sound that sets itself apart from the other two songs on the Hikari no Spur single thanks to the happy beat and uplifting nature of it all. It's a cute song, one which really enhances the sweetness of Negicco's vocals and brings out a fun and playful side to them that was a little less present in their other two songs. Of them all, 1000% no Kataomoi has to be one of my favourite songs from this single overall. It's sweet, it's filled with fun and happiness, and it's a tad bit addictive - it's 1000% no Kataomoi! As a single, Hikari no Spur is pretty well rounded and has a very nice sound behind it. I enjoy the balance of soothing, relaxed songs and the addition of a fun, happy song that isn't so over-the top it detracts from the quality of the single. 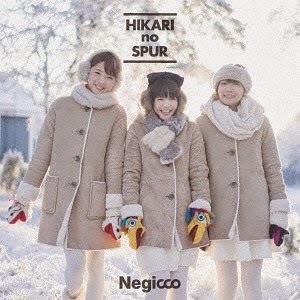 Though this is not my favourite track list for the winter season to listen to, I do enjoy what Negicco has to offer with Hikari no Spur and the sweet, gentle sound they created for this winter season. Individually there are songs I enjoy more than others, there always will be in any single I suppose, however as a whole I found it rather pleasing and enjoyable. Will this bring me into the Negicco fandom any time soon? I doubt it, however it has given me a better look at what Negicco as a group has to offer and also allows me to realise the quality of their music. They are, by far, one of the more talented groups I have heard and they have a very appealing sound behind them that can become addictive depending on what type of sound you enjoy listening to, and I could see myself easily becoming engulfed by their music in the future if I dared to venture into their song collection a little more. 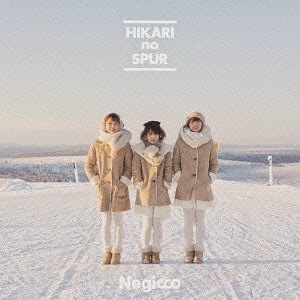 So despite not being one of my favourite songs this year, I do find something to like in Hikari no Spur and its coupling songs, and that is how homely and soothing the songs sound, as well as the friendly and gentle nature of the girls themselves (in terms of their vocals). It's a nice little track list, and if you have the time to dive into Negicco's songs for this winter season, then have a go! You might find you enjoy something a little more than you initially thought you would. It was a pleasant surprise, but I found that I actually did rather enjoy Hikari no Spur and what it had to offer, even when I previously thought I would never get into it. Negicco, the group that somehow grew on me, even if I didn't want that to happen. Is this what winter is truly about?